Balisht are originally conceived as ‘pillow covers’, made for dowry to celebrate the marriage of a young woman. As with many dowry weavings, the quality of the weaving as determined by the women weaving them is the quality of the wool as well as the dyes used. Design is often “pre-determined”, ie. conforming to a prevalent tribal model. Here, the ashik form is used, ashiks with crosses in the center, conceived as a talisman to protect against “the evil eye”. The colors are outstanding with a beautiful sea blue/green ground color on which the the ashiks, colored with a deep aubergine dye with no outlining. 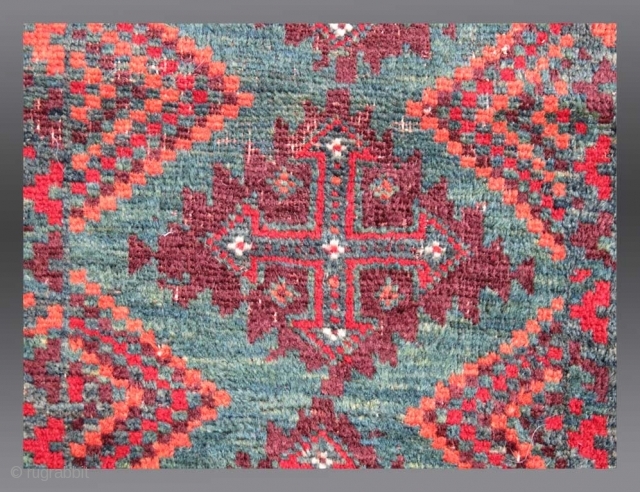 The deep saturation of color, too, is the type of aesthetic appreciated in the oldest weavings of this group. The saturated apricot and scarlet red are both unusual and exceptional in terms of visual impact. Few Baluch weavings extant can rival this example in terms of color saturation. Please inquire for further information/images.